Love is definitely in the air this afternoon after aviation fan Noel Canavan popped the question to his long-term girlfriend Ciara Kavanagh with an aerial banner tow across the East Coast skies. 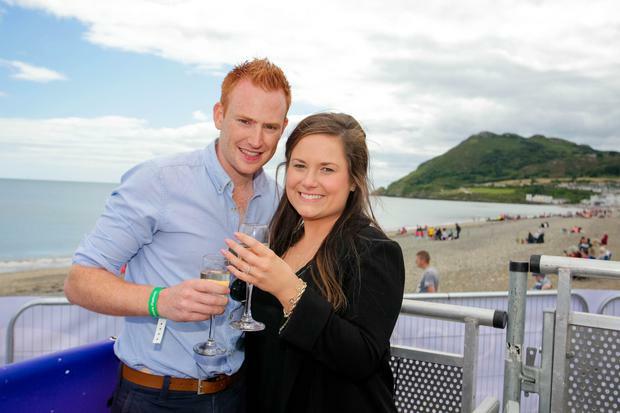 Both 27, the pair from Arklow, Co Wicklow have been together nine years and attend the event every year. To toast the moment, Martina McDermott, Head of Marketing at CityJet presented the couple with flight tickets to Paris and a bottle of champagne. The Director of the Bray Air Display, Sé Pardy of Simtech Aviation, planned the logistics around the aerial proposal. Bray Air Display 2015, part of the Bray Summerfest, kicks off at 2pm today with a full afternoon of aerial and aerobatic spectacle planned. 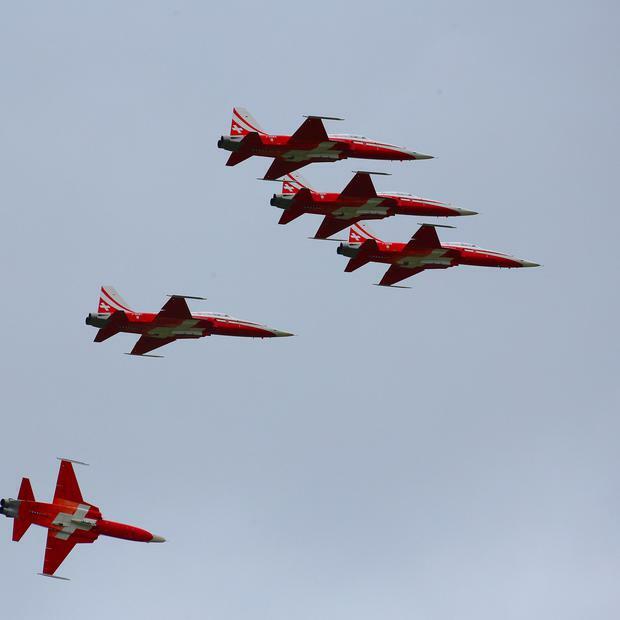 As part of the Bray Air Display, the Swiss Air Force aerobatic team, ‘Patrouille Suisse’ will make their eagerly-awaited Irish debut today, completing manoeuvres such as the ‘Gear Down Barrel Rolls’, the ‘Painted Heart’ and the ‘Tango’ at speeds of between 250 and 1100 kilometres per second. A father and son duo will also take to the skies this afternoon, as Gerry Humphreys, a former R.A.F pilot and organic beef farmer, commands the ‘Flying Cow’, while his twenty-one year old son, Harry, pilots a 1940’s ‘Mini-Mig’ vintage aircraft. The air show will welcome back combat aircraft, the ‘Strikemaster’ and the Ex-UK military ‘Hunter G-BFXI’, which are expected to thrill the crowds with their impressive manoeuvres, along with the vintage biplane, the 1942‘Boeing Stearman’. Three newly restored ‘Chipmunk’ aircraft as well with the iconic 1930s Aer Lingus ‘Iolar’, are set to mark the launch of the Irish Historic Flight Foundation (IHFF) on the day. A stage rescue operation will also be performed by Ireland’s Search and Rescue Team, while the Irish Air Corps will perform a series of formation and solo displays. The event will also feature the ever-popular Black Knights Defence Forces performing a parachute jump out of an Air Corps helicopter at 4,000 feet, while the ‘The Irish Parachute Club’ will open this year’s Bray Air Display. In addition, Ryanair, CityJet and Aer Lingus aircraft will be making appearances on the day. Bray Summerfest Chairman, Mick Glynn, said: “Bray is the perfect backdrop for the Air Display. We are delighted to welcome thousands of visitors to this year’s event. Each year, the event gets bigger and better thanks to the hard work and dedication of some great people. There is something for everyone from the activities in the sky to all the fun of the fair on the ground. Bray really is the place to be this weekend”. #SummerFest is the Independent.ie series on Ireland's Summer Festivals. Tweet your pics with #SummerFest to be featured in our gallery. Think Independent.ie should be covering a festival? Email ccullen@independent.ie with subject line 'SummerFest'.